MU A creates a multi-layered program that meets Latina immigrants where we are, addressing basic needs and dismantling the barriers – low self-esteem, domestic violence, and economic hardship — that could easily prevent us from recognizing our own potential to make change. Daily in MUA’s offices Latina immigrant women take the first step toward change by transforming ourselves in our own eyes – from victims to skilled advocates for ourselves, our families, and our community. Through group support sessions and political education workshops and leadership trainings, MUA members find our voices, make links between personal problems and broader social and economic injustices, recognize our own strength, and build community and collective power. 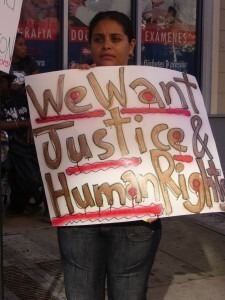 MUA members are subject to racism and sexism and are uniquely positioned to speak out on these issues and lead the struggle to end violence and economic exploitation against immigrant women.